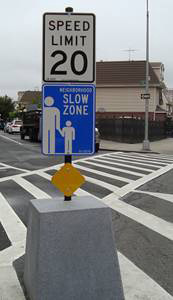 Mayor Bloomberg and NYC DOT Commissioner Janette Sadik-Khan today announced an expansion of the city’s Slow Zone program, which lowers speed limits in selected areas from 30 to 20 mph and implements low-cost traffic-calming measures like speed humps. Bloomberg and Sadik-Khan were joined in Corona by NYPD Chief of Transportation Bureau James Tuller, City Council transportation chair James Vacca and other electeds for this afternoon’s announcement. The city’s first slow zone was installed last November in the Claremont section of the Bronx. The city received more than 100 applications for slow zones from neighborhood groups. We’ll have more on this story later today. Congratulations to the neighborhoods selected! Unfortunately, at this rate it may take another 7 years to meet the demand from neighborhoods. Hope DOT can accelerate implementation once this first round is up and running. Though I agree with Danae and wish it was more widespread and had happened quicker, I do like that the program went from 1 neighborhood to 13 in the blink of an eye. If DOT continues that rate, with these all used as examples of effectiveness, maybe next go around will be many many more? While I support the idea of lower speed limits in residential areas, the speed humps have got to go. Narrow the roads and/or introduce mini-roundabouts at intersections to slow traffic. City streets have enough defects as is without intentionally introducing more. If they insist on using speed humps then at least have cuts for cyclists. The locations of the slow zones are rather interesting. It looks like DOT is trying to generate some goodwill in outer areas that haven’t benefitted from the many recent improvements quite yet. Maybe folks from these areas will be less antagonistic to bike lanes and pedestrian plazas, once they get 20mph zones. Speed bumps need to be remove ASAP. Even Phoenix has 20 mph zones outside each and every school. @qrt145:disqus Speed humps might not be horrible on an MTB with fat, cushiony tires where you’re probably not going much over 15 mph, but on my road bike with hard airless tires at 20+ mph they’re not fun at all. I usually end up squeezing in the narrow bit of space between the speed hump and sidewalk to avoid them. Pass throughs would make speed humps a lot more acceptable in my opinion. Let’s be clear. The speed bumps are the critical part and the only really effective component – the rest is window dressing. Each slow zone gets about 13-14 new speed bumps in addition to a few that are usually already there (see the DOT “Current Projects” website for the detailed maps). Note that these are actually “speed humps”, meant for 20 mph, not “speed bumps”, the things meant for 5 mph you see in parking lots, or “speed tables”, the 30 mph flat speed bumps that are too fast for Slow Zones. By definition Slow Zones are in purely residential areas, no major commercial streets or bus routes. So the only people who should be driving over the speed bumps are residents who will have zero problem with traffic moving a little more slowly by their home and their kids and their neighbors. The entire point is to annoy short cutters or speeders – if you don’t like it, stop cutting through that neighborhood, get it?While it would be nice to have cuts in the humps for cyclists the reality is that these zones are in the outer boroughs (and Inwood, which is close enough) where there are few cyclists but a lot of idiot speeding motorcycles. Cuts would reduce the effectiveness of slowing the motorbikes. The program is a little rough around the edges, and a bit no-frills, but let’s see how it goes. Changes are easy to make and there really is no downside. Go JSK Go! What other forms of traffic calming may be introduced? Any? Narrower lanes? Extended sidewalks? Bollards? Speed cameras? Red light cameras? More pedestrian islands? How about mobile speed humps? Those that can be dropped into place to get the ball rolling? This is simply a scam to get more money from unsuspecting motorists who drive all over the rest of the city at 30 mph. Very much agree with Paco. The city is certainly a big place, but the pace at which this is expanding is great. And as far as that “it’s a scam to ticket drivers” comment goes, I doubt it. The NYPD issues very few speeding tickets – in some precincts, zero or one or two per MONTH. This program will save lives in residential neighborhoods. @0aa0da740667d7623f6c5b9c7b238990:disqus – if a driver is so “unsuspecting” that he does not instinctively slow down in these neighborhoods, and then still fails to slow down after passing a posted speed limit sign and rolling over a speed hump, then they are a clear menace to public safety and probably ought to get more than a mere speeding ticket before they kill somebody. yesss! Awesome. Wish there were way more in Manhattan though. I’d like to see the speed data for Prospect Heights vs. Boerum Hill. I’ve lived in both places and it seems far worse in PH, where the streets are too wide and Vanderbilt Ave lights are kept forever green in order to handle the overflow from Flatbush Ave. I always found Boerum Hill to be pretty calm and safe, except for Atlantic Ave, of course. Has the DOT offered specific reasons for their choices?